To say Colleen Buckley has given back to her IHA family would be an understatement. From serving as Senior and Junior Class President to being team captain of the Cross Country, Winter Track, and Spring Track teams, Colleen has dedicated herself to the IHA community in many extraordinary ways. In addition to running Cross Country and Track, Colleen has also been involved in the National Honor Society, the Spanish Honor Society, Prefects, and the Christian Service Board. Colleen also has great academic accomplishments, excelling in her numerous AP and Honors courses. Her favorite class has been AP Calculus with Mr. Millard, who she says has taught her a lot about life. “I’ve learned more than just math from him, which I think is really important coming from a teacher,” she said. 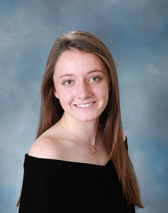 Colleen’s favorite accomplishment at IHA was being elected class president for two years in a row–an achievement that both surprised and humbled her. “I didn’t really expect it to happen, but I’m honored that people respected me enough to put me as their class president,” she said. In her two years as class president, Colleen has been at the helm of organizing class activities from prom to the Senior Talent Show, and she has undertaken every task with a smile on her face. Her strong leadership and constant friendliness towards others have truly set the tone for a tight-knit senior class, one that she will miss very much. “I’m going to miss walking down the hallway and saying hello to every single person just because we’re all so comfortable being around each other,” she comments. Colleen’s school spirit shines through in everything she does. Even when asked about her favorite IHA memory, she responds with a bonding moment between her and her class: breaking out in song with the alma mater at Sophomore retreat. “I think it’s so cheesy and we all joke about it, but it was the start of our grade becoming very, very close,” she shares. With her jam-packed list of activities, Colleen admits that trying to achieve a balance between schoolwork, sports, and friends has been the most challenging part about IHA, but four years have given her good practice. Now she knows that maintaining balance isn’t synonymous with being perfect. “If I had to give advice to freshmen, it would be that you don’t have to be perfect at everything you do. You can do well without being perfect,” she shares. In her time at IHA, Colleen’s passion and dedication have truly made an impact on not only her team and classmates, but the entire IHA community. Next fall, she will continue to contribute her talents at Bucknell University as part of the women’s cross country and track teams. She plans to major in Animal Behavior and Biology and will later apply to veterinary school. Colleen’s love for her IHA family is wholeheartedly reciprocated. IHA wishes her the best of luck in her future and is confident she will continue to succeed!